Pharmacology is a field of study that focuses on drugs and their affects on the human body. Students in the pharmacology programs learn how to create new chemical substances and analyze the effects of medicinal compounds. These programs are not similar to pharmacy. Pharmacy degrees are geared towards preparing students for careers as pharmacists. Pharmacology programs, on the other hand, are based on research of medicines. Pharmacologists find out how drugs work in order to use them effectively. They study how potential medicines interact with biological systems and conduct research to aid drug discovery and development. They can specialize in neuro pharmacology, regulatory pharmacology and clinical pharmacology. A number of academic programs are offered in the field of pharmacology. Students can work towards degree or certificate programs. They can pursue bachelor's or master's degrees and study biological sciences. The coursework in these programs may include topics such as medicinal chemistry, toxicology, molecular cell biology and path physiology. Students can also enroll in PhD programs in pharmacology. These programs prepare students for positions in research. They provide students with in-depth knowledge in pharmacology and physiology. The coursework in these programs includes subjects such as principles of pharmacology and advanced pharmacology. Dissertation research is the most important aspect of these advanced degrees. 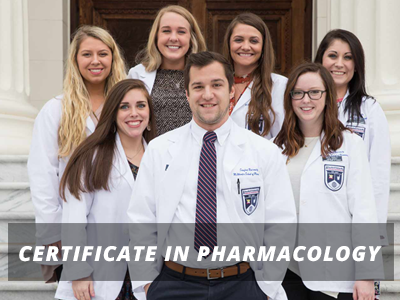 Students can also pursue certificate programs in pharmacology. Those who already hold a degree in the field can advance their knowledge and skills by working towards pharmacology certificate programs. They may pursue a graduate-level certificate offered by National Association for Practical Nurse Education & Services, Inc. There are various schools that offer online programs in pharmacology. The ones who are already engaged in jobs may enroll in these online programs to earn advanced credentials to enhance their career prospects. These programs allow students to keep up with their personal and professional routine and pursue their educational goals alongside. Students in online pharmacology programs may study remotely and complete a degree or certificate at their own pace. A high school diploma or its equivalent is required to enroll in a pharmacology program. Students who want to get into the PhD programs need to hold a bachelor's degree. They should also submit a personal statement along with letters of recommendation. In addition, they may have to pass Graduate Record Examination (GRE) general test. A degree in pharmacology can help students pursue a variety of career paths. They can become researchers or look for opportunities in developing new drugs for diseases. Positions may also available in hospital labs or within the public and private health sectors. There are various schools that offer degrees and certificates in pharmacology but not all programs are equally good. As the choice of the right school can make all the difference in your career, you must try to look for the renowned programs so that you may increase your chances to qualify for the most desired positions. Q:What are the education requirements to be a Psychopharmacologist? A:To become a psychopharmacologist, you first need to get a bachelors degree with emphasis on physics, chemistry and biology. After this, you need to apply to an accredited medical school to earn a doctor of medicine or other postgraduate degree. This degree would be followed by a residency and then certifications. Q:What should you look for in a university for a pharmacology degree? A:When selecting a pharmacology school, make sure you consider the following factors: accreditation of the school as well as the program, ranking of the institute, student reviews, faculty, educational facilities, location, and costs. It is important that you enroll in a college which offers quality education services and is worth your time and resources. Q:What is the difference between pharmacy and pharmacology? A:Pharmacy can be described as a healthcare profession that is concerned with medication distribution and use. Pharmacists are licensed professionals who provide medication to patients and help optimize health through medical therapies. On the other hand, pharmacology is the study of drugs and their interaction with living systems. Pharmacology is often studies as a course within pharmacy degree programs.